So I saw this and I couldn't help it but to think about the Passport... I'm so interested in the form factor!! I am definitely going to pick that up! I dunno about beautiful. Looks interesting though and the fact it will be available to others opens plenty of options. BlackBerry Mobile could effectively build out a Passport-like device now if they wanted to especially since Google is also supporting the displays with new API's and developer options. They'd have to work out some keyboard, though, or just rely on a virtual keyboard. Samsung makes beautiful phone! Quality should be top notch. so NOW it's hip to be square? ppeters914 and BigAl_BB9900 like this. It also looks like it would support a Passport form factor as far as screen ratio. Basically what Bla1ze said in Post #4 . This could only mean GOOD news for a Passport Android version, 2020 maybe? The_Passporter and krazyatom like this. LOL....so now samsung picked up? on the Blackberry Z20/20 phone/tablet concept (20/20 perfect eye sight) replacement for the Blackberry Playbook tablet first discussed back on BlackBerry's discussion boards before they closed way back when. Zte's Axon M been around for a year now (a little more conventional but still a fold open bigger screen). The aspect ratio reminds me of the LG Vu series. Perhaps people can whine about letterboxed videos on another brand now. New info on it lists a 4x3 screen (4.2x3, actually), so it's not square. Can't really compare to a Passport and say "see, android can do 1:1", because it's not 1:1. 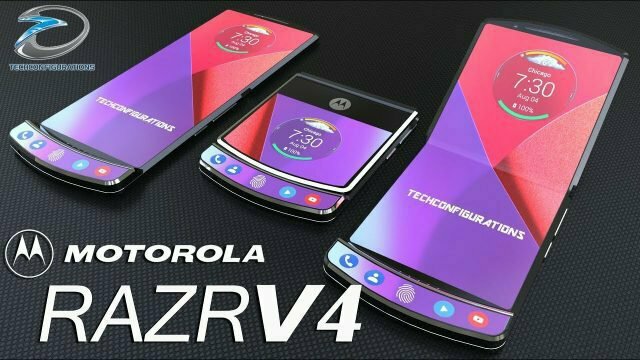 I started a thread on this Motorola Razr4 folding concept phone. Physical keyboard or not I would jump on this flip/folding phone. Not sure how I feel about a tablet size foldable phone. Not at $1,000+ that's for sure. I guess time will tell. I'm also wondering if that screen would eventually show permanent signs of a fold. Even if it did have a PKB I'd be waiting a year to see how people got on with it with sustained use. It's not really relevant to compare what was available then to what is available now. As I noted, Android updated their API's since then and are fully supporting foldables. Still, even with that in play it'll be up to developers to produce functional UI elements. I'm having a hard time seeing how some apps would ever adpat to the format. Kind of like how Android tablets are now, even to this day, a lot of apps don't run properly. ppeters914 and rarsen like this. So screens on all sides . . . Can't drop this one at all! I doubt the screen will crack, might scratch all to he'll. If you drop it? Has more vulnerable positions. I doubt the screen is glass. Probably a plastic film of some kind. Samsung Foldable Phone --- is it the Passport re-incarnated?